This pizza is a staple in our home and is a deconstructed version of a pasta that I have been making for Randall for years—spaghetti with pesto, chicken and bacon. When we first started making pizza, we decided to “deconstruct” that pasta recipe and try it on pizza. The results were delicious. The salty bacon and the sweet pesto along with the chicken make for a delicious combination. In a glass measuring cup, combine water (warm to the touch), yeast and sugar. Stir for a minute or so to dissolve and let the mixture sit for 15 minutes while the yeast foams up and “proofs”. Place dough hook into mixer and place flour and wheat germ into bowl, add yeast mixture, olive oil and salt and process for 5 minutes. Dough will come together and be kneaded by the action of the mixer. Alternatively, you can mix the yeast mixture, oil and salt into the flour and knead by hand on a lightly floured counter/surface for 10 minutes. When dough is kneaded it will be soft and elastic. (NOTE: because bread dough responds differently to various conditions, you may have to add up to 2-3 tablespoons of warm water to have the dough come together based on the flour used, humidity etc. )—don’t worry. If the dough isn’t coming together, just drizzle water in a teaspoon at a time until it gathers into a ball. Place kneaded dough into bowl, coat with the one tablespoon of olive oil, cover with plastic wrap and let rise on the counter for 3-4 hours–a long slow rise is essential for maximum flavor and if you like, you can accomplish this by placing into the fridge overnight for up to 24 hours (the cold of the fridge will slow down the rising but create a really flavorful dough). When ready, take it out of the fridge and let it come to room temperature and proceed with pizza below. Take dough out of bowl onto a floured surface (counter, board, marble). Do this gently so as not to deflate the dough too too much. Let the dough rest for 10-15 minutes. Divide the dough into two equal portions. Preheat oven to 500 degrees and place pizza stone on highest rack. Let the pizza stone heat for 15 minutes before proceeding. You want a hot stone for a crispy crust and you want the pizza stone on the top rack because hot air rises and this will make for a fast bake and crispy crust. 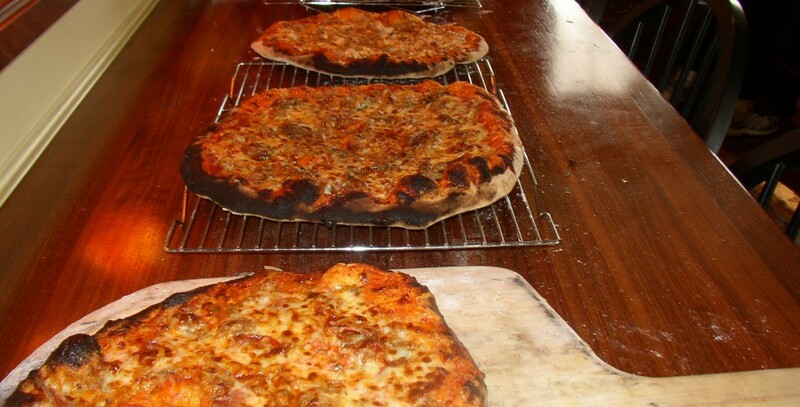 Place dough on cornmeal lined pizza peel (paddle) or rimless sheet pan or cutting board. The cornmeal makes for easy sliding into the oven. Jiggle the dough to make sure it slides. Sprinkle with both cheeses so as to blanket the bacon and chicken (so as not to burn). Slide onto pizza stone for 7-8 minutes or until bubbly. Adding a splash of soy sauce to your salad dressing adds a dimension of flavor that you will not soon forget. If you don’t like walnuts, feel free to substitute pecans or even sliced almonds. To toast walnuts, place the walnuts in a small shallow frying pan and toast the walnuts in over low/med heat until they become lightly browned. Don’t walk away from the pan. Keep shaking it and when you start smelling them, they’re done. Chop coarsely and place aside. Place the washed and dried greens in a bowl and add the sliced avocado, sliced apple, cranberry and walnuts. In a small bowl stir together the Olive oil, balsamic vinegar, mustard and soy sauce. Stir well and drizzle over salad. Toss and serve. Serves 4. NOTE: This will not result in a heavily dressed salad, which I find heavy and soggy. Rather, this will be a light dressing that just slightly coats the greens and other ingredients. Add fresh ground pepper and serve. Salt is not necessary because the soy sauce can be salty, but add it to taste, if you like. NOTE: Use the apple and avocado immediately after slicing or you’ll risk them both turning color. If you are preparing the salad in advance, peel and add both the avocado and apple at the last minute, then dress the salad with the dressing and then serve. NOTE: If you’d like to make spiced walnuts for your salad, dust ½ teaspoon of cayenne pepper over the nuts after the toasting is complete and they are still warm. This will add a little bite to your salad. Blue Cheese Version: Add ½ cup of crumbled blue cheese on the finished salad, which tastes great with the balsamic dressing and walnuts. The inspiration for this sangria came from the Shop Rite fruit and vegetable aisle. I saw the prickly pears, and remembered that my friend Rick Patt had served Prickly Pear Margaritas at a party. Why not use them in sangria I thought? It worked beautifully, and the color was amazing. My little luxury? Topping the sangria off with Champagne! To make the prickly pear juice: Peel the prickly pears and chop them coarsely. Be very careful because the color is incredibly red and will stain your clothes. Place the chopped fruit in a food processor and process until liquid. Run the pulp through a strainer and into a large bowl. This should yield ½ cup of juice more of less depending on the size of the fruit. You may also use your juicer for this. Place the prickly pear juice in a bowl, add the sugar and Grand Marnier and stir well. Add the sliced fruit and let marinade for a few hours in the fridge. Place the fruit mixture in a large pitcher and add the wine (the color will be a beautiful reddish/orange). Stir well and chill. When ready to serve, fill your glasses three quarters full with the sangria and top off with chilled champagne. NOTE: The easiest way to seed pomegranate is to cut the fruit from stem to stem into four quarters. Then invert them over a bowl (with one hand) and hammer with a wooden spoon (with the other hand). All of the seeds will fall into the bowl. You may have to pick away at the membrane to loosen it a bit but this works every time. NOTE: If you cannot find prickly pears or prickly pear nectar/juice, you may substitute pomegranate juice which is available at all grocery stores. Of all of the cakes and desserts I have made, this ranks as one of my favorites. I shamefully admit that last year I became somewhat obsessed with Tres Leches Cake and made it every chance I got. It didn’t start out that way though! When I first heard about this cake, popular all over Latin America, I just didn’t get the fascination. A milk cake I thought? Nothing could have been less appealing to me. But, after seeing Tres Leches as a Haagen Daas ice cream flavor, I knew I had to give this cake a try. After all, it had made it to my grocer’s freezer all the way from south of the border! I did some google research and sure enough, a milk cake is exactly what it is. The recipe couldn’t be simpler. A simple pound cake is drenched with three kinds of milk (read: tres leches) and then, after chilling in the fridge, you spread sweetened whipped cream all over it. Simple enough I thought, but what could I do to add another dimension of flavor? Knowing that Dulce de Leche is another popular Latin American flavor, and never wanting to leave well enough alone, I came up with this. Instead of cutting the cake into boring squares and serving it on a plate with no accompaniment, I scooped the cake into martini glasses and drizzled warm cayenne caramel sauce all over it! Every glass came back to the kitchen empty—licked clean in a few instances. I wish I could take credit for the cake, but I can’t. It’s been around Latin America for years and only recently has it been discovered here in America. But I will take credit for the cayenne caramel sauce because I love opposites in food–spicy and sweet, salty and sweet, hot and cold. Make this cake! You will love it. It’s light, sweet (but not overly so) and utterly unique in its flavor and texture. Preheat your oven to 350F and place rack in middle position. Spray a 13×9 inch pan with non stick spray. Cream butter and sugar in the bowl of a stand mixer until light and fluffy, about 5 minutes. Add the eggs one at a time and blend thoroughly after each addition. Add the vanilla and the slowly add the flour one tablespoon at a time until blended. Turn mixer off and give the bowl a few stirs with your hand spatula so as to ensure that everything is mixed. Scrape the batter into the pan and bake at 350F until cake pulls back from the sides of the pan and springs back when touched in the center, about 25-30 minutes. The cake will be golden brown on top. Remove from oven and cool on a rack until room temperature (about 60-75 minutes). Leave the cake in the pan. While cooling mix the three milks in a large bowl or measuring cup and chill. When cake is at room temperature, poke holes all over it with a fork and SLOWLY drizzle the milk all over the cake taking time to allow the milk mixture to seep in. Do this very slowly and the cake will absorb it nicely. Do it quickly and you’ll have a major mess. Refrigerate. Beat the heavy cream with ¼ cup of sugar and 1 teaspoon of vanilla to just before stiff peaks form. Scoop the whipped cream all over the cake in the pan. Chill again. Always keep in the fridge if you are not using it immediately. Cake should be served cold. To serve, scoop portions of cold cake into martini glasses and drizzle with warmed cayenne caramel sauce. Place the sugar and water and corn syrup into a heavy bottomed pan and slowly heat over medium heat until the sugar begins to liquify. Do not stir. Swirl the pan and continue to do so until the sugar has caramelized into a beautiful amber brown. Don’t take it too far or the sugar will burn. Better to err on the side of light brown than burned sugar. Take the pan to the sink and place it onto either the sink rack or a potholder in the sink. Add the heavy cream very slowly as it will spatter. The heavy cream will actually stop the sugar from cooking further. (some of the sugar will harden—do not worry). Add the cayenne. Then bring the pan back to the heat and stir over low/med heat until the sugar again dissolves. This will take a few minutes. Do it over low/med heat so that the cream does not boil over. Turn off the heat and add the butter and vanilla. Stir well. You can refrigerate the sauce and then reheat gently when you are ready to serve (reheat over low flame and you may need to whisk the sauce for it to come together–low flame so it does not boil over). I have a no fail carrot cake with rum sauce recipe to die for. I’ll share it if you are interested! wow can’t wait to try all these recipes. They look so good. same with your cakes. yummy!!!!!!!!!!!!!!!!!!!!!!!!!!!!!!!!!!!!!!!!!!!!!!!!! !